Bora monastery in Sangchu, eastern Tibet is under lockdown as the situation continues to remain tense following more arrests and protests yesterday. Chinese security officers from the local township office entered Bora monastery at around 2 am (local time) on March 21 and arrested 40 monks according to the Dharamshala based Tibetan Centre for Human Rights and Democracy. As news spread of the midnight raid and arrests, a large number of monks gathered, calling for the immediate release of fellow monks. The local security officials, fearing more protests, released all 40 monks a few hours later at around 11 am (local time). However, the released monks and others who participated in the protest march have been told to make “personal statements” admitting that they have made a “mistake” which they will not repeat in future according to TCHRD. “The local officials have demanded that the monks turn in the portraits of His Holiness the Dalai Lama and Tibetans flags which were prominently featured during the protest march,” TCHRD said. On March 20, more than 100 monks from the monastery had marched towards the township-level government buildings carrying Tibetan flags and pictures of the Dalai Lama while calling for freedom in Tibet and the return of the Dalai Lama. According to the London based Free Tibet, the gate to the monastery was locked by the Democratic Management Committee and officials from township government following the protest march. “The monks were told that no one was allowed to leave until those who were protesting turned themselves in and handed over the flags and pictures. They warned that there would be serious consequences for everyone if this wasn’t obeyed,” Free Tibet said in a release yesterday. March 22: In additional reports coming out of Tibet on the March 18 mass protests in Ba county, a Tibetan minor was killed after Chinese security forces used explosives and tear gas to disperse the unarmed protesters. Speaking to Dharamshala based radio service VoT, a Tibetan in the region said that a 12-year-old Tibetan child died in the “excessive and unprovoked” use of force on the peaceful protesters. Speaking on condition of anonymity, the Tibetan further said that Dorjee Tsepel, a prominent Tibetan singer was arrested along with his wife and two sons, suspecting their involvement in the protests. A number of Tibetans had gathered Sunday near the local judicial complex in Ba county, eastern Tibet, to demand the release of around 50 monks from the Shingtri monastery. The police had fired tear gas and used explosives to disperse the peaceful protesters. Scores of Tibetans sustained severe injuries, while seven of them are believed to be in a critical condition. “Few of the injured have been admitted in hospitals but many of the seriously injured have not received any medical treatment,” the Tibetan told VoT. Protesters were demanding the release of the Shingtri monastery monks, who were arrested on March 16, a day after they carried out a protest march to the district headquarters. The monks had raised slogans demanding the return of His Holiness the Dalai Lama from exile and freedom in Tibet. The next day, Chinese security forces arrived at the monastery and arrested 50 monks on suspicion of their involvement in the protest march. Reports suggest that the monks have now been taken to another location while security in the region has been tightened following warnings of more severe protests. According to sources, lots of “unfamiliar” Chinese soldiers, apparently transferred from other regions, have been deployed in the region. DHARAMSHALA,March 22: Chinese security personnel have foiled self-immolation attempts by two Tibetans in the past few days, after reports surfaced of Chinese authorities announcing financial rewards to the public for providing information on planned immolations. Tsekhong, a handicapped Tibetan, was arrested yesterday in Gansu, eastern Tibet for attempting to set himself on fire in front of the Ala township centre, according to US based radio service RFA. Tsekhog had sprayed kerosene all over his body and drank the fuel but before he could light his body, Chinese security personnel arrived and whisked him away. “Tibetans suspect that a local resident, in the hope of getting a reward, had alerted the police about Tsekhog's plan to self-immolate,” RFA said citing sources in the region. A monetary reward of 5,000 Yuan for “alerting” the police and giving “credible” information about self-immolation protests was earlier announced by local authorities according to the report. In other reports, Thinley, 17, a Tibetan student in Serthar, eastern Tibet, tried to burn himself, but due to an overdose of gasoline consumption, fainted at the site of his planned protest. Exile based newspaper, Tibet Times reported that on March 12, Thinley poured gasoline all over his body and drank "plenty" of the fuel in a bid to set himself on fire. “However, Thinley had an overdose of the gasoline consumption which caused him to faint at the protest site, deterring his immolation bid,” the report said. Chinese police manning the streets in the region arrested Thinley, who is actively engaged in a local association promoting Tibetan language preservation. Since then, no information about his well being and whereabouts is available. As many as 30 Tibetans have torched their bodies since 2009 in Tibet, demanding the return of His Holiness the Dalai Lama from exile and freedom in Tibet. The rest are being described in “serious condition,” having sustained spinal cord injuries and amputation of all limbs. The Tibetan exile parliament, which is currently in session in Dharamshala, is today holding an informal closed-door meeting to debate on the critical situation inside Tibet. On the first day of the ongoing session, the parliament held extensive discussions on the spate of self-immolations and mass protests inside Tibet and passed a unanimous resolution urging the Chinese leadership to immediately end its repressive policies in Tibet and allow an international fact-finding delegation to visit Tibetan areas. The charred body of Sonam Dhargey covered with 'khatags' offered by thousands of gathered Tibetans at the Dolma square in Rebkong, eastern Tibet on March 17, 2012. March 17: Details are finally emerging on the self-immolation protest that took place in Rebkong, eastern Tibet earlier today. The 30th Tibetan to set his body on fire demanding the return of His Holiness the Dalai Lama from exile and freedom in Tibet since 2009, has been identified as Sonam Dhargey, a 44-year-old farmer. He succumbed to his burns at the site of his protest near the Rongwo town centre. Sonam Dargye is survived by his wife Dolkar Kyi and three children (two sons and one daughter). An exile Tibetan with contacts in the region told Phayul that Sonam Dhargey had travelled from his village and stayed overnight at a lodge in the town. “In the morning Sonam Dhargey offered prayers before a photo of His Holiness the Dalai Lama, took bath to cleanse his body and then drank petrol,” Lobsang Choejor said citing source in the region. Marching in the street, engulfed in flames, eyewitnesses heard Sonam Dhargey call for the return of the Dalai Lama from exile. Sonam Dhargey had wound his torso with barbed wires, a tactic that has been earlier used by self-immolating Tibetans to restrict Chinese security personnel from getting hold of their bodies. Local Tibetans carried Sonam Dhargey’s body to Dolma Square, the main ground in front of the Rongwo monastery, the site of monk Lobsang Palden's self-immolation protest three days ago. As news spread of Sonam Dhargey’s fiery death, thousands of Tibetans from all over the town as well as from nearby villages, including some 600 Tibetans from Sonam’s village poured in to show their solidarity. London based Free Tibet in a release today quoted eyewitnesses as saying that this was the “biggest gathering of people” in Rongwo town. Other sources say up to 8000 people assembled to pay their last respects. “Sonam’s wife and other relatives are distraught but are described as not angry that he chose to die as they believe his decision to give his life was important and noble,” Free Tibet said citing sources in the region. Although truckloads of Paramilitary People’s Armed Police arrived at the scene but they chose to withdraw seeing the large numbers of Tibetans present. Amidst prayers led by the monks of the Rongwo monastery, Sonam Dhargey was cremated at a crematory behind the monastery, considered sacred by the Tibetans. According to Free Tibet, the gathered people, after the funeral, started a march from the cremation site to Rongwo town centre calling for freedom and for the long life and return of the Dalai Lama. “Other people from the town joined them on the streets as they marched. According to an eyewitness, hundreds of local people are continuing to protest in the streets,” the release said. March 17: In more disturbing news coming out of Tibet, another Tibetan set himself on fire earlier today in the Rebkong region of eastern Tibet. Today’s incidence comes hours after yesterday’s self-immolation protest by Lobsang Tsultrim, a monk at the Kirti monastery in Ngaba, which marked exactly one year since the recent wave of self-immolations began on March 16, 2011 with monk Phuntsog’s fiery protest. 30 Tibetans have torched their bodies since 2009 demanding the return of His Holiness the Dalai Lama from exile and freedom in Tibet. According to a report by Tibet Times, a Tibetan, identified as a student, self-immolated at around 9:30 am local time earlier today in an apparent protest against the Chinese regime. The student reportedly died soon after the self-immolation protest. There are currently no details available on the identity of the student. “A large number of school students and local Tibetans are right now marching towards the Rongwo monastery, carrying the deceased's body and raising slogans,” an exiled Tibetan who had a telephonic conversation with a source in the region said. “As soon as news of the self-immolation spread, local Tibetans started to gather at the Dolma square in front of the Rongwo monastery to offer prayers,” the report added. This is the third self-immolation protest in Tibet this week alone and the second in Rebkong following Wednesday’s fiery protest by Lobsang Palden, a monk at the Rongwo monastery. Lobsang Palden’s current well-being is not known but eyewitnesses have told sources in exile that his chances of survival were “minimal”. Video clips and images of mass protests in Rebkong in the aftermath of Lobsang Palden’s self-immolation that were leaked out of the area, showed hundreds of monks and local Tibetans gathered in front of the monastery chanting and praying. A number of people were also seen holding up a picture of the Dalai Lama, whose image is banned in Tibet, and shouting slogans with their arms raised in the air. On the same day, a large number of students in Rebkong and in the nearby region of Tsekhog carried out protests. In Tsekhog, hundreds of students from at least two schools, marched to the county government office, protesting for language rights and equality for Tibetans. The students, holding a very big banner, calling for freedom of language and equality, marched to the County Government Office building before moving to the County Public Security Bureau Station and then to the People’s Armed Bureau where militia are trained and weaponry stored. Meanwhile in Rebkong, students from Gedun Choephel middle school, Rebkong nationality school and Yiphu middle school took to the streets in a show of solidarity with Lobsang Palden’s self-immolation protest. “The students later held demonstrations inside their school after they were outnumbered by police and security forces. Similar peaceful protests by students were also reported in the nearby areas of Rebkong district,” the Dharamshala based Central Tibetan Administration said in a release. DHARAMSHALA, March 16: Exactly a year after monk Phuntsog set himself on fire demanding the return of the Dalai Lama from exile and freedom in Tibet, another Tibetan has set himself on fire today. Lobsang Tsultrim, a 20-year-old monk from the besieged Kirti monastery in the Ngaba region of eastern Tibet set his body on fire at around 5 pm local time. According to the exile base of Kirti monastery in Dharamshala, Lobsang Tsultrim set himself ablaze on the main street in the upper region of Ngaba town. The fire was extinguished and Lobsang Tsultrim was thrown into a police vehicle. “Even as Chinese security personnel had pinned him on the floor of the moving vehicle, Lobsang Tsultrim was seen raising his fist in the air and raising slogans,” the release said quoting eyewitnesses. Born to Yeshi and Tsedron, Lobsang Tsultrim is the eldest of four siblings. He was enrolled into the monastic order at the age of eight and throughout his schooling years, he was amongst the brightest students in the monastery. Since Phuntsog’s self-immolation protest, 28 Tibetans have torched their bodies in the past one year alone, protesting China’s continued occupation of Tibet. In anticipation of protests on the one-year anniversary of monk Phuntsog’s self-immolation, Chinese security personnel were on high alert since morning, the release said. In the past few months, several foreign journalists attempting to enter the Ngaba region including reporters from the BBC and CNN have been detained, thrown out, and threatened of visa revocations. An Associated Press journalist reported that soldiers with helmets, rifles, sticks, and shields marching in rows were not only patrolling the streets, but also “policing the minds” of the community. "The locals are definitely feeling very heavy-hearted, very frustrated, all day. The soldiers are everywhere," the report quoted a teacher as saying. "At every moment, people wonder what will happen to the person next to them, what the soldiers will do to them." "Essentially you've got a town that's on edge - a town that's divided between the potential immolators and those standing by to extinguish," the Guardian reported. Many countries have expressed serious concerns over the ongoing crisis inside Tibet and urged China to address the grievances of the Tibetan people. The Tibetan exile parliament, which is currently in session, held extensive discussions on the spate of self-immolations and mass protests inside Tibet and passed a unanimous resolution urging the Chinese leadership to immediately end its repressive policies in Tibet and allow an international fact-finding delegation to visit Tibetan areas. DHARAMSHALA, March 16: The clampdown on Tibetan intellectuals and activists continues in Tibet with the recent arrests of four Tibetan environmental activists in Tawu, eastern Tibet. The Dharamshala based Tibetan Centre for Human Rights and Democracy in a release yesterday said that the four arrested were members of a locally-founded environment group. “Four Tibetan environmental activists, all members of the locally-founded Tawu Environmental Protection Association, were arrested in mid-February 2012 by the local Public Security Bureau (PSB) officers at Tawu (Chinese: Luohuo) County in Kardze (Chinese Ganzi) Autonomous Prefecture, Sichuan Province,” TCHRD said citing sources in Tibet. “Lumbu from Chagya village, Dakpa from Khucha village, Dawa from Yulo village, and an unidentified Tibetan man from Loru village were arrested and questioned by PSB officials,” the release added. According to TCHRD, the Tawu Environmental Protection Association was founded informally in 2011 by local Tibetans hailing from various villages in Tawu County. The group had earlier organised protests against “rampant mining, deforestation, and smuggling of wildlife products” in the region and in other cases, fined Chinese fishermen for fishing in sacred rivers. Since the mass uprisings of 2008, China has systematically cracked down on Tibetan intellectuals and activists, banning many organisations as well literary and cultural magazines and websites. Last month, Gangkye Drubpa Kyab, a popular author, was arrested from his home in Serthar, eastern Tibet. He had worked as a teacher for about a decade and authored popular compositions in Tibetan such as "Call of Fate," "Pain of This Era" and "Today’s Tear of Pain." In January, Dawa Dorje, a prominent lawyer and a government researcher in Nagchu, who has been a popular advocate of Tibet’s culture and language was disappeared by Chinese authorities from Lhasa’s Gonggar Airport. Following the instances of self-immolations and recent protests in Tawu, the entire region is reeling under a heavy security clampdown. "These days, Tibetans in Tawu are required to attend many meetings addressed by local officials who give lengthy speeches asking the Tibetans not to participate in Tibetan 'separatists' activities and threatening them of dire consequences if they did," TCHRD said. March 14: Reports of beatings, arrests and monks being expelled from monasteries continue to flow out of Tibet as the entire region reels under, what rights groups have called, an undeclared martial law. On March 7, Khedup Dorjee, 38, a monk at Za-Samdrup Monastery in Kardze, was severely beaten and arrested by Chinese security officers, according to the Dharamshala based Tibetan Centre for Human Rights and Democracy. Khedup Dorjee was involved in a peaceful protest in the crowded market of Kardze. His current whereabouts are unknown. In another incident, TCHRD said that a Tibetan man, identified as Tashi Palden, was beaten with batons and rifle butts by Chinese security personnel for carrying out a peaceful protest at the market place in Kardze on February 11. “He shouted slogans such as ‘Long Live His Holiness the Dalai Lama’ and ‘Independence for Tibet’,” TCHRD cited sources as saying. In other reports, more than a hundred monks from the Karma monastery in Chamdo were expelled following a government decree. “Monks without proper identification staying at the Karma monastery have been expelled and returned to their places of origin, according to a recent internal communiqué issued by the monastery management committee, “ US based radio service RFFA said citing sources. “They are now made to work as laymen on local farms, with local village committees being put in charge of the monks’ ‘reeducation,’” the report said. Reports coming in from Lhasa say that a Tibetan NGO worker, who was sentenced to life following the 2008 uprisings in Tibet, was seen in an army hospital in the capital February end. TCHRD in a release said that Wangdue, a well-known HIV/AIDS activist, was being kept in a solitary room in the hospital guarded by three police officers, citing eyewitnesses. “One of his hands was apparently broken and he had one side of his head shaven,” TCHRD said while adding that Wangdue could have sustained those injuries as a result of beatings in prison. Wangdue was arbitrarily detained by the Lhasa City Public Security Bureau (PSB) officials from his home on March 14, 2008 in Lhasa and was later sentenced to life following which he was transferred to Chushul prison near Lhasa. March 14: Reports of yet another self-immolation by a monk in Rebkong in the traditional Amdo region are coming out of Tibet. Jamyang Palden, 34 a monk at the Rongwo monastery in Rebkong set himself on fire in an apparent protest against the Chinese government earlier today. The Dharamshala based Tibet Times newspaper has cited sources in exile as saying that Jamyang Palden self-immolated on a ground in front of the monastery. “Tibetans who were present at the site of Jamyang Palden’s fiery protest immediately took him to a hospital in Marlho town but soon after, he was brought back to the monastery,” the report said. It is not clear why Jamyang Palden was brought back to the monastery but it is widely believed that the move was taken to rescue him from falling into the hands of Chinese security personnel. In earlier instances of self-immolation protests, eyewitnesses have said that Chinese security personnel at the scene of the protests have resorted to brute force, beating Tibetans who are still on fire with spiked clubs. Reports have confirmed that Tibetans who had survived their self-immolation protest had to go through amputations and were subjected to verbal abuse and maltreatment from the doctors and Chinese officials at the hospital. “Right now, a large number of monks and local Tibetans are gathered at the ground in front of the monastery, the site of Jamyang Palden’s protest and offering prayers,” sources said. There are no further details available at the time of filing this report. With Jamyang Palden’s self-immolation, 28 Tibetans have now set their bodies on fire demanding the return of His Holiness the Dalai Lama from exile and freedom in Tibet. Washington – Tibet activists welcomed China’s future President, Xi Jinping, to the U.S. capital by hanging a massive banner which stated, "Xi Jinping: Tibet will be Free" on the landmark Arlington Memorial Bridge. Against the iconic American backdrop of the Washington Monument and the Lincoln Memorial, two climbers - Bianca Bockman (age 31) of Hoboken, New Jersey and Tenzin Jigme (age 32) of Vienna, Virginia - rappelled over the edge of the bridge and unfurled the 52' x 20' foot protest banner. They were later arrested along with Matthew Zaccarino (age 32) of Milford, Massachusetts and Tenzin Yangsel (age 25) of Queens, New York. The action kicked off a day-long festival of protest in the capital by hundreds of Tibetans and their supporters including a rally and march from the Chinese Embassy to the White House, a mass Buddhist prayer offering, life-size puppets, solidarity rallies, and a candlelight vigil. "As a Tibetan-American born in Tibet, I have to speak out at this critical moment when Xi Jinping and the Chinese government have literally declared war against my people and are shooting peaceful protesters in the streets of Tibet," said Tenzin Jigme, of the International Tibet Network. "Xi Jinping has come here seeking American friendship and approval, and President Obama, as the leader of the greatest democracy in the world, has the power to influence Xi and stop this bloody crackdown." Vice President Xi Jinping's visit comes as reports that Losang Gyatso, age 19, self-immolated in Ngaba town in eastern Tibet at 2:30pm Beijing Standard Time today. Twenty-four Tibetans have now set fire to themselves in Tibet since 2009, 11 since January 2012, in an unprecedented show of defiance to Chinese rule. In an effort to stop news of the unrest reaching the world after security forces opened fire on protesters calling for Tibetan freedom and the return of the Dalai Lama, the Chinese government has sealed Tibet off to foreigners and journalists. "Xi Jinping is here representing a regime that is right now engaged in an-all out vicious assault on the Tibetan people, while at the same time directly supporting the Syrian dictatorship in massacring its own people," said Bianca Bockman, member of Students for a Free Tibet. "Is Xi really the person that we want our President to be on a date with on Valentine’s day? I don’t think so. Americans care most about freedom, democracy and basic human rights." "I believe that all Americans would want to see freedom and independence for Tibetans in Tibet, for Syrians in Syria," said Tenzin Yangsel, of the Regional Tibetan Youth Congress of New York and New Jersey. "Xi Jinping is a representative of a murderous authoritarian dictatorship, and is in fact the last person President Obama should entertain at the White House on Valentine’s Day." A joint rally in support of freedom and democracy will be held outside the White House tomorrow by a coalition of Tibetan, Chinese, Uyghur, Taiwanese and human rights groups as Xi Jinping and President Obama meet. “We sought to directly confront the Chinese authorities in Germany with the legitimate concerns of many German citizens, among them a large number of members of the International Campaign for Tibet in Germany. Only through dialogue and respect for human rights, there can be a lasting solution for the issue of Tibet – that’s what many Germans hold as aspiration.” Said Kai Mueller, Executive Director of the International Campaign for Tibet Germany. DHARAMSHALA, March 13: A senior United Nations officer pledged to contact UN Secretary General and Human Rights Commissioner, after meeting the three Tibetan hunger strikers on their 20th day of indefinite fast outside the UN Headquarters. Ivan Simonovic, UN Assistant Secretary General expressed his “deep concerns” at the health of the hunger strikers and said that he will “directly contact” UN Secretary General Ban Ki-moon and Human Rights Commissioner Navannethem Pillay regarding their demands. The three hunger strikers – Shingza Rincpohe, 32, Dorjee Gyalpo, 59, and Yeshi Tenzing, 39, began their “Indefinite Fast for Tibet” on February 22 demanding UN intervention in the ongoing crisis inside Tibet. Simonovic also invited Tsewang Rigzin, president of Tibetan Youth Congress, the largest pro-independence group in exile and organisers of the indefinite fast for a formal meeting in his office to discuss the situation inside Tibet and the ongoing hunger strike. During the meeting, Rigzin “strongly reiterated” the worsening situation inside Tibet under the prevalent “undeclared martial law” and called for an immediate UN intervention to stop further loss of lives. “The three hunger strikers are willing to wait until their last breath to hear from the UN Secretary General on their five appeals to the UN,” Rigzin told the Assistant Secretary General. “When the Tibetans in Tibet make the ultimate sacrifice, their hope is the United Nations and the international community to be their voice,” he added. TYC, in its 53rd Tibetan National Uprising Day Statement had called for a change in the Central Tibetan Administration’s official Middle-Way policy, which seeks autonomy for the Tibetan people. A teenaged Tibetan monk in eastern Tibet burned himself to death in an apparent protest against China’s rule on March 10, the day marking the 53rd anniversary of the 1959 Tibetan uprisings. Gepey, an 18-year-old monk from the Kirti Monastery in the beleaguered Ngaba region set himself on fire on Saturday March 10 at around 5pm (local time) according to exile sources. The exile base of Kirti monastery in Dharamshala in a late night release today said that Gepey self-immolated near a military camp in Ngaba town that was built in the 1950s for China’s “liberation army” when they first invaded Tibet. “Due to the proximity to the military camp, Chinese soldiers quickly arrived and carried Gepey’s charred body inside the camp and refused to hand it over to the deceased’s family,” the release said. A day later, on March 11, after much persistence, Chinese authorities decided to allow only five people from Gepey’s family to take part in the funeral, according to the release. The family was ordered to have the funeral immediately and his body was cremated at 10pm (local time) on March 11, without proper traditional funeral rites. The cemetery was surrounded by security officers keeping a close watch on the proceedings. Gepey is the third Tibetan in a row to self-immolate near Chinese government buildings, which are symbolic of China’s continued occupation of Tibet. Dorjee, self-immolated on March 5 walking towards a local Chinese government building, while on March 4, Rinchen torched her body in front of a police station especially set up outside the gate of Kirti monastery in Ngaba. Gepey, a semi-orphan, is survived by his mother and two brothers, both of whom are monks. According to Kirti monastery, his mother was summoned by Chinese security personnel for daylong interrogation sessions on March 11 and 12. Due to the tight security clampdown in Ngaba, which alone has witnessed more than 15 self-immolations, Tibetans in the region came to know of Gepey’s death only on March 12. “Local Tibetan shops and restaurants remained closed today in a strong show of solidarity with Gepey’s courageous act,” the release said. More military, paramilitary and police personnel have been deployed in Ngaba town since Saturday. 27 Tibetans have set their bodies on fire since 2009 demanding the return of Tibetan spiritual leader His Holiness the Dalai Lama from exile and freedom in Tibet. DHARAMSHALA, March 10: Thousands of Tibetans led by His Holiness the Dalai Lama and the exile Tibetan leadership took part in the official commemorations of the 53rd Tibetan National Uprising Day at Tsug-la Khang, the main temple in Dharamshala earlier today. The function began with the proud rendition of the Tibetan national anthem as Kalon Tripa Dr Lobsang Sangay raised the Tibetan national flag. A minute-long silence was observed to mourn the thousands of Tibetans who have sacrificed their lives for the cause of Tibet. In his official statement, Speaker of the Tibetan Parliament-in-Exile, Penpa Tsering called on China to address the genuine grievances of the Tibetan people and urged leaders in Beijing to change their repressive policies in Tibet. “How can China win our hearts when they are turning Tibetan monasteries into military garrisons and forcing monks and nuns to display photos of Mao Zedong, Deng Xiaoping, and Hu Jintao along with the statues of lord Buddha,” Speaker Penpa Tsering questioned. “Trust is the foundation for peace and stability and China has the power to build trust by releasing all political prisoners including the XIth Panchen Lama,” the Speaker added. Hailing the Dharamshala based Central Tibetan Administration as the legitimate representative of the six million Tibetan people, Dr Sangay asserted that Beijing’s view of a generational change in Tibetan leadership weakening the Tibetan movement will never materialize. “The resiliency of the Tibetan spirit combined with a coming generation of educated Tibetans will provide dynamic leadership and sustain the movement till freedom is restored in Tibet,” Dr Sangay said. “When China invaded Tibet in 1949, it promised to usher in a ‘socialist paradise’. In actuality Tibetans are treated as second class citizens”, Kalon Tripa said while quoting the Chinese communist party’s recent declaration of “war” against Tibetan protestors. The de facto Tibetan Prime Minister blamed China’s repressive policies for the 26 self-immolations that have taken place in Tibet since 2009. “Today, there is no space for any conventional protests such as hunger strikes, demonstrations and even peaceful gatherings in Tibet. Tibetans are therefore taking extreme actions,” Dr Sangay said. Following the official function, thousands of Tibetans and supporters carried out a protest march led by the exile family of Tseten Dorjee who started their return march to Tibet today. Tibetans carrying coffins symbolic of those who died in recent protests in Tibet raised slogans for a Free Tibet and Long Life of the Dalai Lama. Similar protests commemorating the March 10, 1959 Uprising in the Tibetan capital Lhasa, which led to the death of thousands of Tibetans and the eventual escape of the Dalai Lama, have been carried out all over the world. Lhamo Tso, wife of imprisoned Tibetan filmmaker Dhondup Wangchen, speaking at Times Square in New York on March 10, 2012. DHARAMSHALA, March 10: On the eve of the 53rd National Uprising Day of Tibet, wife of jailed Tibetan filmmaker Dhondup Wangchen broke into tears as she spoke at New York Times Square at an open-air press conference. Excerpts from Dhondup Wangchen’s film, “Leaving Fear Behind,” a hard-hitting documentary carrying interviews of ordinary Tibetan people on their views of the Dalai Lama and the Chinese government, were screened beneath a large screen brought by China’s state news agency Xinhua for presenting the official government point of view. Blaming the Chinese government for the ongoing wave of self-immolations in Tibet, Lhamo Tso, 40, questioned: "Why are they doing this? Why are they burning their own bodies? Their life is the most important thing they have." "When I hear that Tibetans are self-immolating, I feel a knife through my heart." Wangchen was sentenced to six years in prison for “subversion” on December 28, 2009 following a secret trial. In prison Wangchen contracted Hepatitis B and has been reported in poor health. "I want to ask for your help in the release of my husband -- in the release of my husband and in the release of other political prisoners in Tibet," Tso, who last spoke to her husband in 2008 said breaking down into tears. "I'm here in the center of the United States but my heart and mind are always with my husband." Organisers of the press conference, Amnesty International USA, Reporters Without Borders and Committee of 100 for Tibet, said they chose Times Square to increase the visibility and specifically to counter the "official government point of view" broadcasted over the Xinhua screen on a skyscraper. In the run up to today’s Uprising Day commemorations, three Tibetans died in self-immolation protests in Tibet last week. One Tibetan was shot dead in the face while two others were seriously injured in yet another case of police firing on unarmed Tibetans suspected of taking part in peaceful anti-China protests a few days earlier. 26 Tibetans have set their bodies on fire since 2009, calling for the return of Tibetan spiritual leader His Holiness the Dalai Lama and freedom in Tibet. The 19th screening of 'Little Tibet' at Harthem Park on 4th March 2012 went very well. The Venue was sold out and extra seats were brought in to accommodate people who had turned up on the door. The end of the Film was greeted with a round of applause and many people said how much they had enjoyed watching the film. The Director and star Sonam was present to take questions and answers at the end and we found out that it was made on a budget of £25k and there may be a sequel. Here are a few images from the evening. DHARAMSHALA, March 5: In alarming news coming out of Tibet, another Tibetan died today after setting himself on fire protesting China’s occupation of Tibet. This is the third self-immolation in as many days. Dorjee, 18, a native of Cha Shang in the beleaguered Ngaba region of eastern Tibet set himself on fire at around 6.30 pm local time today. The exile base of Kirti monastery in Dharamshala, in a release said that Dorjee carried out a march from a bridge to a Chinese office in the region. “Dorjee was engulfed in fire as he raised slogans protesting the Chinese government’s policies in Tibet while marching towards the office building,” the release said. Dorjee later died at the scene of his protest. Cha Shang is located around 70 kms east to the main Ngaba town, the centre of the ongoing wave of self-immolations in Tibet. “Local Tibetans tried to gain possession of Dorjee’s charred body but Chinese security personnel forcibly took it to Ngaba town,” the release added. In the past two days, two women – Tsering Kyi, a 19-year school students and Rinchen, a 32-year old mother of four – torched their bodies protesting China’s continued occupation of Tibet. Since 2009, now 26 Tibetans have set themselves on fire demanding the return of His Holiness the Dalai Lama and freedom in Tibet. The three self-immolations come days ahead of the 53rd anniversary of the March 10 Tibetan National Uprising Day and the one year commemoration of the March 16 self-immolation of Kirti monk Phuntsog. Many parts of Tibet remain under an undeclared martial law following the fiery wave self-immolations and a series of mass protests that have been brutally suppressed. China has poured money into Tibetan-inhabited areas, seeking to win them over by boosting the economy. But it has also flooded the same areas with police, increased surveillance at monasteries and partially blocked the Internet and mobile phones. Foreign journalists caught trying to reach the scene of much of the unrest - in the west of Sichuan province - have been turned back or detained. March is a month of sensitive Tibetan anniversaries including that of the Dalai Lama's flight into exile in 1959. BBC Asia-Pacific analyst Viv Marsh says Chinese authorities will be keen to avoid protests during a parliamentary meeting in Beijing this week ahead of a big leadership transition later this year. DHARAMSHALA, March 5: A teenaged Tibetan school girl torched her body in an apparent protest against the Chinese occupation of Tibet in a busy market in eastern Tibet. Tsering Kyi, 19, studying at a local middle school set herself on fire at a vegetable market in Machu in the traditional Amdo region of Tibet on March 3. She passed away at the scene. The Dharamshala based Tibetan Parliament-in-Exile, in a release today said that Chinese security personnel arrived at the scene of the protest and locked down the market. The police later visited Tsering Kyi’s house for identification and carried out door to door searches in the neighbourhood. Websites operating from the region have been shut down and heads of the regional government offices reportedly held a meeting following the protest. Tsering Kyi’s body is in the custody of the local police according to sources. Reporting on the self-immolation protest, US based RFA said that Chinese market vendors threw stones at the girl's burning body, citing an unidentified Tibetan exile with connections to the community in Machu. "The Tibetans present in the market were agitated and this almost resulted in a major clash between the Tibetans and Chinese," RFA quoted a source as saying. This is the first self-immolation protest that has been reported from Machu region. A day after Tsering Kyi’s self-immolation, a 32 year-old Tibetan mother of four, Rinchen, torched her body in the Ngaba region, which has been at the centre of the recent wave of self-immolations in Tibet. Since 2009, 25 Tibetans have set themselves ablaze demanding the return of His Holiness the Dalai Lama from exile and freedom in Tibet. Ahead of the ongoing rubber stamp parliament session, Beijing vowed to “smash” all peaceful expressions of protests inside Tibet and increase internet and phone surveillance in the region. The exile Tibetan leadership and right groups have expressed fears of more self-immolation and further bloodshed in Tibet during the sensitive period of the March 10 Tibetan National Uprising Day. DHARAMSHALA, March 4: In confirmed reports coming out of Tibet, a Tibetan mother of four passed away after setting her body on fire demanding the return of His Holiness the Dalai Lama and freedom in Tibet. The self-immolation occurred in the beleaguered Ngaba region of eastern Tibet at around 6.30 a.m. (local time) today. Rinchen, 33, torched her body in front of a special security office outside the main entrance of the besieged Kirti monastery, specifically set up by the local Chinese authorities following the spate of self-immolation and protests in the region. According to sources in exile, monks from the Kirti monastery were able to rescue Rinchen’s charred body and carried it inside the monastery. “Engulfed in flames, Rinchen raised slogans demanding the return of His Holiness the Dalai Lama and freedom in Tibet. She passed away immediately,” said the exile base of Kirti monastery in a release today. The eldest of Rinchen’s four children is 13 years old while the youngest is a few months old baby. Their father passed away last year. The stringent security measures in place were beefed up in the region following the self-immolation. Rinchen’s self-immolation protest comes days ahead of the March 10 Tibetan National Uprising Day and the one year anniversary of the March 16 self-immolation of Kirti monk Phuntsog, which ignited the ongoing fiery wave of self-immolations in Tibet. Since 2009, 24 Tibetans have set their bodies on fire protesting China’s continued occupation of Tibet. Ngaba alone has witnessed 16 self-immolations. International journalists who have been able to sneak into the restricted Ngaba region have described the town as a “conflict zone” with security personnel, armed with automatic rifles, stationed all over the place. Kirti monastery has faced severe repression with hundreds of its monks having disappeared, detained without charge and given lengthy jail terms. Hundreds of Chinese security personnel and CCTV cameras inside the monastery have been keeping a close watch on the movement of the monks. Last week, an Associated Press journalist who managed to get through several checkpoints along the road leading to Ngaba reported that China's “stifling lockdown” has not only been about patrolling the streets, but also “policing the minds” of the community. "The locals are definitely feeling very heavy-hearted, very frustrated, all day. The soldiers are everywhere," a teacher was quoted as saying in the report. "At every moment, people wonder what will happen to the person next to them, what the soldiers will do to them." DHARAMSHALA. March 4: Rigzin Dorje, 19, who set his body on fire raising slogans against the Chinese government on February 8 in Ngaba town, passed away in a Chinese military hospital on February 21. Eyewitnesses had told sources in exile that he was “on the verge of death” following his self-immolation protest. Rigzin Dorje alias Rigpe was from the Garpa Tsongko household in division no.2 of Me’uruma township, Ngaba and the youngest of six siblings. Chinese security personnel removed Rigpe from the site of his self-immolation protest to a hospital in Barkham where he passed away. The exile base of Kirti monastery in a release today said Chinese authorities declined to hand over the deceased’s body to his family. “Instead they cremated Rigzin Dorje without following traditional Buddhist rituals,” the release said. “Local Chinese officials have told family members and local Tibetans not to hold prayer gatherings and religious services for Rigpe,” the release added. Another self-immolating monk, Lobsang Kunchok who set himself ablaze on September 26, 2011 has lost all four limbs. He has also been subjected to verbal abuse from the doctors and Chinese officials at the hospital. Lobsang Kunchok along with another Kirti monk Lobsang Kalsang, both in their late teens, had carried out their fiery protest in the central town of Ngaba, raising slogans calling for the long-life of His Holiness the Dalai Lama and religious freedom in Tibet. “All four limbs of Lobsang Kunchok have been amputated and he is being fed through a pipe in his throat,” the Dharamshala based Kirti monastery said in its release. London based Free Tibet in a separate release today said that Lobsang Kunchok’s family have been denied any visiting rights and have not seen their son since his self-immolation. “Lobsang Kunchok has been subjected to verbal abuse from doctors and Chinese officials including accusations of trying to destroy 'his country',” Free Tibet said. – on the streets, at road blocks, monitoring the monastery, conducting house-to-house searches. Since 2009, 24 Tibetans have set their bodies on fire demanding the return of His Holiness the Dalai Lama from exile and freedom in Tibet. Tibet is currently facing a ban on visitors and foreign journalists trying to enter Tibet have been detained and warned with visa cancellations. Many parts of Tibet continue to remain under an undeclared martial law following the ongoing wave of self-immolation and mass protests that have been brutally suppressed. 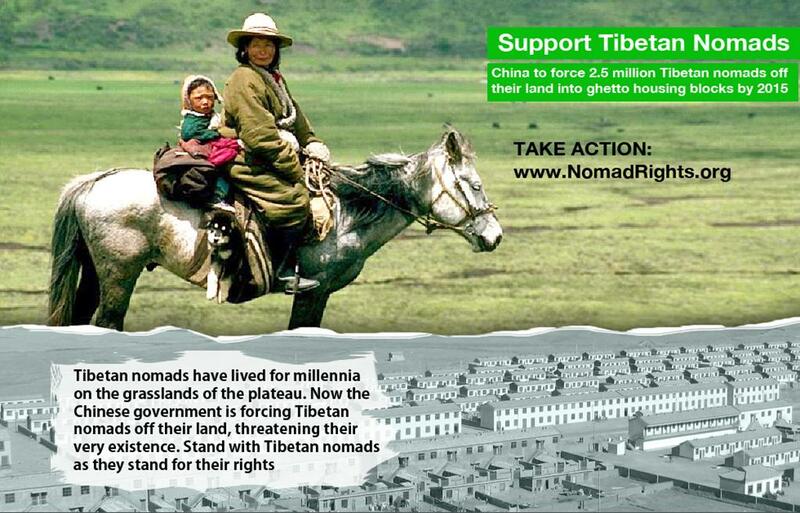 We are hosting in Corsham Town Hall an afternoon devoted to the plight of the Tibetan Nomads. This event will consist of short talks from a variety of speakers and video clips.